The scent of honey emanating from our two hives has been pretty overwhelming for the last several months. Almost every time we go outside the fragrance of a sweet, slightly salty aroma wafts our way. This enchanting tang is most prevalent in the afternoon when the pacific ocean breezes start to move northward through the canyon. Speaking of canyons, aren't these pictures of two fused combs amazing! Generally early Spring is a good time to harvest honey because the nectar flow has started and the bees will be able to restock whatever we take easily. 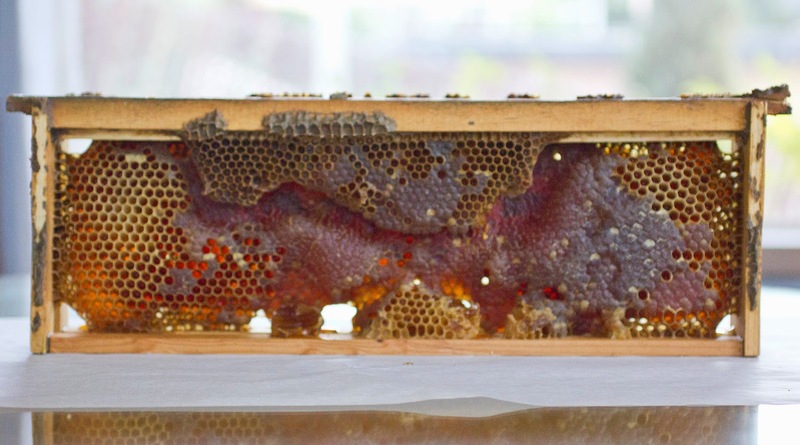 The challenge this year was that the top boxes weren't just honey but a mix of brood (baby bees) and honey. In "normal" situations the bees keep their brood nests down below and use the upper boxes for honey. Thus, instead of taking the entire top box off we only took a few frames so as not to disturb their slumbering babes too much. Here's a photo of some crazy comb that was built across two frames. The image I am showing you has empty cells with capped honey cells, but deep within and on the other side it is all capped. I photographed this side because it was much more interesting visually with all the undulating levels. The perfectly capped comb is pretty boring, thus no photos of those. This seasons crop is dark with rich notes of caramel. I am not entirely clear what imparted that imprint since what has been blooming in our woodland for the last six months has a more camphorous character. The rich, molasses type note might be from our California native everlasting, Pseudognaphalium californicum, although it hasn't bloomed in the woodland since last Spring. 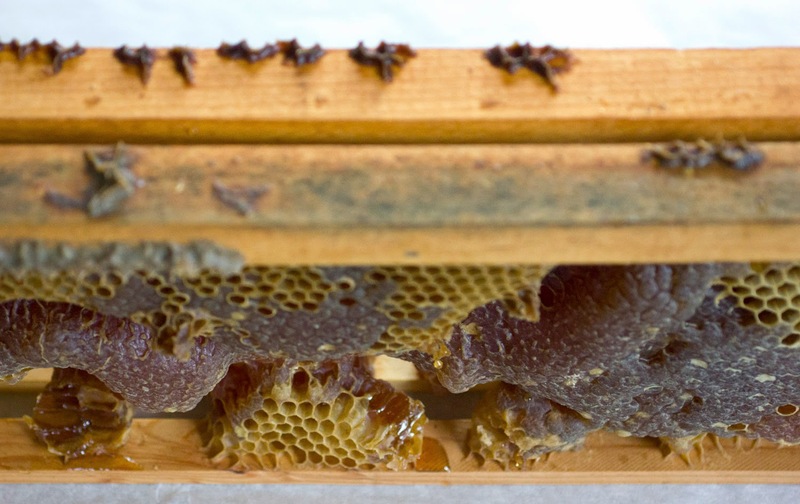 Each frame of completely capped cells contains about 1 gallon of honey. A honey bee gathers nectar from two million flowers for one pound of honey! Although I haven't actually measured the amount of wax from one of those frames will likely be in the ballpark of 5% of the yield. 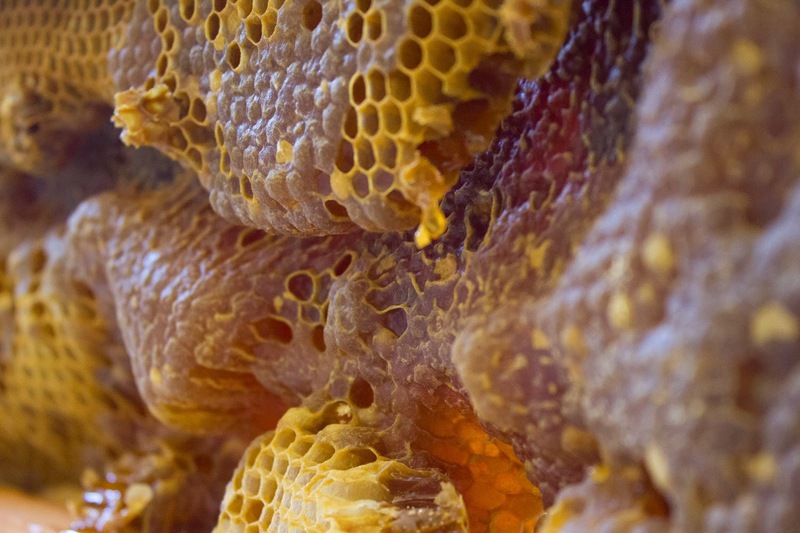 It's pretty amazing to think that such a small amount of beeswax is used to hold so much honey! We are told that the average worker bee makes 1/12th of a tspn of honey in her lifetime. 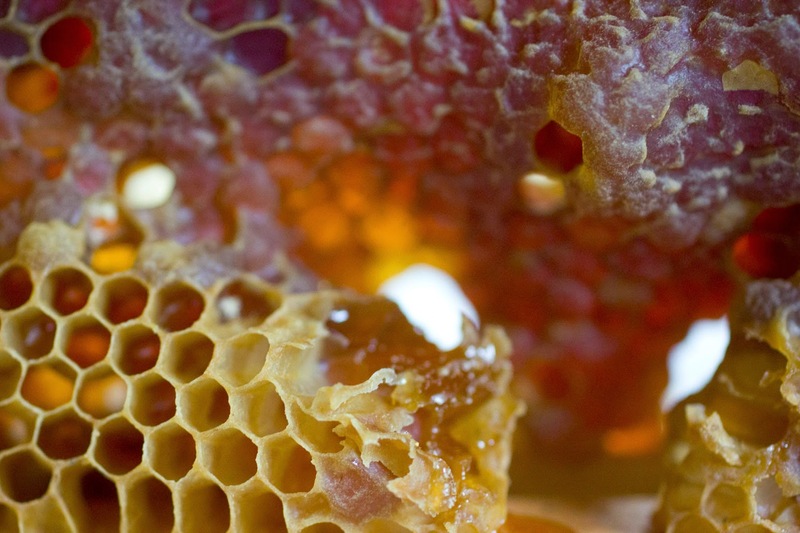 Eight to ten pounds of honey will yield approximately one pound of wax. Pretty staggering numbers, imagine if humans were that focused!